The Sherwood Forest property was first recorded as a land grant in 1616 and originally known as Smith’s Hundred. In 1842, after several generations of owners, 10th President John Tyler purchased the 1660 acres called “Walnut Grove,” and renamed it Sherwood Forest. This estate included a circa 1720s home and several dependencies. Renovations undertaken by President Tyler connected a kitchen and garconniere to the main house and the result is a classic example of the Virginia Tidewater design known as “big house, little house, colonnade and kitchen.” It is the longest frame house of its age in America, 300 feet in length, and includes a 68 foot 1845 ballroom addition where many a prominent Virginian danced the popular Virginia Reel. The design of the 50 acres of terraced gardens, woodlands and lawn was influenced by the mid-nineteenth century New York landscape designer, Andrew Jackson Downing. Over 80 varieties of centuries-old trees are scattered through the landscape. Trees now obscure the view of the water, but during John Tyler’s era, a sweeping view of the river was an important part of the viewshed. Mrs. Tyler would have tables and chairs brought to the grassed terraces for tea parties where guests could relax under the shade of trees. In another part of the landscape, there is evidence of a large open space where a formal garden once flourished. There are six Tyler era dependencies surrounding the grand home including a tobacco drying shed, a smoke house, a privy, a dairy, slave cabin and overseer’s house. President John Tyler died in 1862 after 20 years of living in his beloved Sherwood Forest. The property has remained in the Tyler family to this day. The president’s grandson, Harrison Tyler, lived at the home until recently. Sherwood Forest Foundation, a private foundation of the Tyler family, maintains the home and property today. 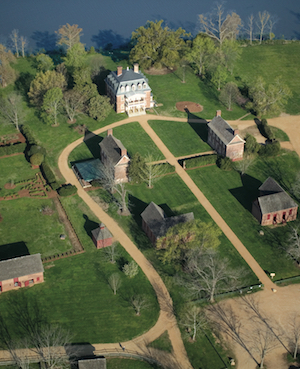 The plantation is both a National and Virginia Historic Landmarks, and is on the National Register of Historic Places. Grounds are open to the public daily and the house may be toured by appointment. Visit www.sherwoodforest.org for more information. Shirley Plantation was settled in 1613 by Sir Thomas West, 3rd Baron De la Warr in what was then known as the West and Sherley Hundred. In 1638, a 450 acre tract was granted to Edward Hill I upon which he established a prosperous tobacco farm. Over time subsequent generations added to this acreage. It now consists of 700 riverfront acres. Hills II and III continued the family business until when in 1723 the last of the Hill progeny, great-granddaughter of the Hill I, Elizabeth Hill, married John Carter, eldest son of Robert “King” Carter. Anne Hill Carter was later born to John and Elizabeth Hill Carter at Shirley Plantation. Anne Hill married “Light Horse Harry” Lee in the mansion’s parlor. This couple later became the parents of the esteemed Robert E. Lee. The “Great House” was begun in 1723 after the marriage of John and Elizabeth and completed in 1738. Built in the form of a 48-foot cube, the Anglo-Dutch style home features a mansard roof and Flemish bond brick pattern. Five dormers and two large brick chimneys add a stately presence to the upper half of the building. A grand two storied portico is found on both the front and rear entrances. The house is surrounded by support buildings such as a stable, smoke house, and dovecote to a traditional Queen Anne Forecourt of manor, kitchen building, laundry building, and two L-shaped brick storehouses. This majestic setting frames the house with the backdrop of the James River. The Hill Carter Family has continued at Shirley since its beginnings in the early 1600’s and to this day represents eleven generations of one family to continue to own, operate and work the plantation. The 350 year old Willow Oak tree still standing on the property, shaded the many generations of Hills and Carters, and was present when the colonies were establishing their own nation. 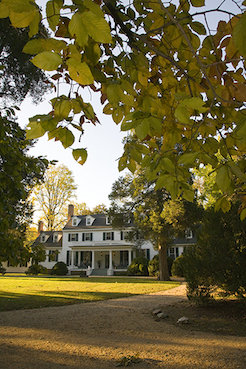 Steeped in the history of this country and considered Virginia’s first plantation, Shirley Plantation has gained the status of the National Historic Landmark, the National Register of Historic Places and Virginia Landmarks Register. Open to the public daily. Visit www.shirleyplantation.com for more information.